Cook pasta, drain, and cool. Meanwhile, preheat oven to 375 degrees. In a large bowl, whisk together ricotta, eggs, thyme, oregano, and 1 cup Parmesan. Season with 1 teaspoon salt and 1/2 teaspoon pepper. Stir in mushrooms. Using a plastic bag for filling, stuff cooled pasta shells (about 3 tablespoons ricotta mixture in each). Coat bottom of a 9-by-13-inch baking dish with 2 cups tomato sauce. 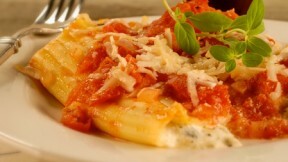 Line up manicotti in baking dish, and cover with 2 cups sauce. Sprinkle with remaining 1/2 cup shredded Parmesan. Bake until bubbly, about 30 minutes.